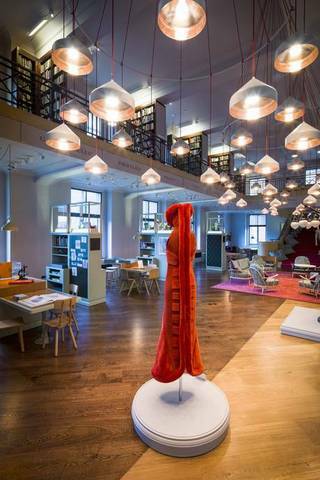 Helen and Kate Storey’s Red Fur Neuralation Dress, from the Primitive Streak collection, originally created in 1997, is now permanently on show in the new Reading Room at Wellcome Collection, and opened to the public February 2015. Primitive streak is a science-art collaboration elucidating 10 key events in human embryonic development by artist/designer Helen Storey (London College of Fashion) and biologist Kate Storey (University of Dundee). Helen and Kate first collaborated on the project in 1997 to create a series of fashion/textile designs, spanning the first 1,000 hours of human life. 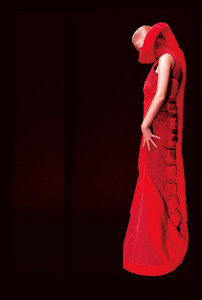 Producing these at London College of Fashion, Helen and Kate worked interactively using design at multiple levels to evoke the key embryonic processes that underlie our development. Elucidating the first 1,000 hours of human life in fashion and textiles. This collection has been touring for 11 years, and has been seen by 5 million people in 8 countries. 14 years on, Helen and Kate collaborated again to produce new dresses, which explore the science behind the development and function of the lungs. The full collection was 27 dresses, of which 10 toured in 2011.